Let’s get a little corny and a little wild, the operative word being wild. In your lifetime, you may have enjoyed a serving of wild rice with your dinner, but have you ever eaten wild corn? Imagine sitting down at a family barbeque because you’ve been told there will be grilled wild corn on the cob. Your mouth waters, but when the food arrives, your cob has only ten kernels. You look around and that’s all any of the mature ears have. Let me explain. If you’re interested in how maize (corn) and teosinte morph, it is best to ask a geneticist. You can also find good information about Native American Corn from an anthropologist. Recently I learned from archeologists about the discovery of a corn cache in Mexico that dates back to over 3,000 years BC! As for more recent history, here’s something interesting: Prior to Christopher Columbus and his exploration of the Americas (in 1492, Columbus sailed the ocean blue…), Europeans did not know about corn, but they enjoyed native wheat, oat, rye, and barley. By the time Francisco Vasquez de Coronado began the infamous expedition to find gold, corn was a known crop. Although the conquistadors did not discover the precious metal, they did consume copious quantities of golden corn taken from the store houses of Pueblo Indians. While researching corn for my newest book, I learned that many American Indian tribes have what they call a Green Corn Ceremony. Activities include among other things, games and dancing, but it is the good medicine of forgiveness that captures my attention. After forgiveness comes renewal. In other words, unforgiveness ushers in a kind of death. While I cannot attempt to explain the nuances of this ancient tradition, I know the power of a forgiving heart. And this, I learned from wild Indians and corn. Forgiveness is the central message of a certain book one of my main characters must regularly reference. See if you can guess which book by going to my Books page. Until then, enjoy the many delicious and valuable uses of a crop that has evolved from the diligence and ingenuity of an intelligent and sophisticated culture. A Cairn Spanish Trail Marker? On the east side of I-25 from Denver to Colorado Springs, high atop a mesa called Rattlesnake Butte in Douglas County, something protrudes. And I wonder, is it an old Spanish trail marker? What appears to be a pile of rocks is hard to discern from the road below. The butte is fenced off, private property. Cattle occasionally ramble across the base. My research thus far has not produced any definitive answer, but my imagination soars when I think of who may have constructed the cairn. One theory postulates a pioneer family allowed their daughter, a victim of tuberculosis to climb the mountain to obtain healthy quantities of fresh air. I suppose it’s possible, but it is difficult for me to imagine someone so ill climbing and piling rocks up fifteen feet high. And I wonder if this story isn’t confusing Rattlesnake Butte with Nemrick Butte. Still, an old wagon road attests to the fact that stone was hauled from the top. A cairn is a conical stack of rock (not to be confused with cairn puppies, a really cute terrier breed). This type of marker varies in size, and can be found all over the world. Some are painted, some have flags inserted through the center thereby making the flagpole visible for miles, but most are simply small trail signs. 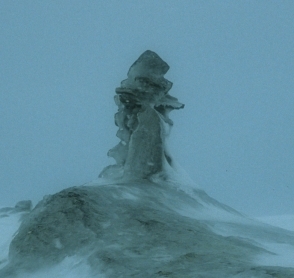 You may notice in the side of a cairn a rock that sticks out, which seems to point the way. In North America, these are called ducks or duckies since they can look like a beak, but you shouldn’t necessarily rely on their accuracy. The beak may be a slide out from rain, or an unintentional bump. The expression “two rocks do not make a duck” defines this possible irregularity, so make sure you confirm your path with a map or compass. The next time you ride your bike though National Parks or hike cross-country trails, if you see a cairn that appears to be eroding, consider whether you should add a stone to counteract erosion or other disturbances. What if a Spaniard built the cairn? Who did he hope would see it? Was it a trail marker? A distress signal? A ruse? For me, the cairn atop Rattlesnake butte remains a mystery. Until I learn otherwise, I will enjoy the theater of my mind as I envision who built it and why. And perhaps, someday, I will write a book about it. Do you have any cairn mysteries? Or has time eroded the marker from your heart? If so, search until you find it. You don’t have to have all the answers, but I urge you to never stop asking the questions; they are the stones that build the monuments of our lives. When considering where in the USA to take your next vacation, it would be worthwhile to visit the National Register of Historic Places. Here you will find a list of places deemed invaluable to our nations history. My personal interest in Early Explorers, Human Rights, and Westward Expansion are accessed from the tab, Find A Park, and By Topic. For example, when I clicked on Human Rights, I found Trail of Tears, which includes a pop-up summary to help me decide if that’s what I was looking for. I mention this because of a recent announcement by the National Park Service to award dozens of American Indian tribes a share of a $2.2 million dollar grant to use toward programs that will preserve oral history and protect sacred places. This news has also been announced through the Navajo Times. Many pueblos visited by the Francisco Vasquez de Coronado’s expedition to find Cibola and the seven cities of gold will benefit from this grant. Who hasn’t eaten vanilla ice-cream, vanilla cake, or smelled the comforting fragrance of vanilla candles? The creamy flavor and homey scent evokes many happy memories. 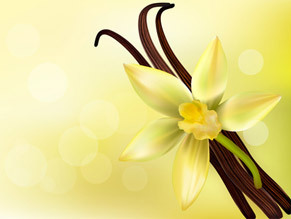 But vanilla was not known to most of the world until after the year 1519 and a meeting with the Aztecs. Spanish conquistador Hernán Cortéz landed in what is now Mexico and attended a Totonac religious ceremony. As he met with Emperor Montezuma, he was offered a drink called Xocohotl, which was a blend of chocolate and vanilla (chocolate was also a mysterious ingredient, but that’s another story). Cortéz loved the beverage and sent some to the Holy Roman Emperor, Carlos V. As you can imagine, shipping costs in the 16th century were very high, so the beverage became a status symbol for European Aristocrats and Royalty.